Offer you a realistic cost estimate of your project prior to construction starting. This cost estimate will enable you to evaluate the costs prior to starting the expensive phase of building. Deliver a construction schedule prior to construction starting. This project schedule will enable you to evaluate the time constraints you will need to plan for with regard to alternate housing, relocating your family or preparing for a summer trip to your new weekend home. Also, if you would like to obtain multiple bids for the construction of your project, having a complete set of drawings and specifications will enable you to obtain more than one bid and evaluate the costs and time estimates. On the other hand, if you don't have a complete set of drawings and specifications, the contractor will not have enough information to price your project prior to construction or estimate the time needed to complete the project. Therefore, not being prepared for the construction phase will most likely result in higher prices thru change orders, delays in the project schedule and a stressful & unsatisfying experience. These three consequences alone could easily pay for your architectural fees. The time to begin every project is unique. Your project size, it's complexity, the physical site conditions and your aesthetic preferences are just a few of the elements that make your project unique and therefore the time required to design your project can vary. In many cases a building addition and renovation will take anywhere from six months to a year to complete the design and working drawings required for a building permit. On the other hand, a small project such as a kitchen, dormer addition, or master bedroom suite renovation would take much less time. No. It would be impossible to have two architects with the same education, knowledge, skills, and values even though all architects go through the same licensing process here in Washington State. Because of this difference, it is recommended that you take the time to interview at least three architectural firms and determine who is a good fit for your project based on their knowledge, values, business process, and personality. In addition, make sure you trust your architect as they will be collaborating closely with you throughout the duration of your project. Your architect will analyze the zoning and land use codes where your project is located and determine if the project you envision is permissible by code. By identifying limits early in the game, you are able to move forward with creative ideas that respect boundaries and efficiently utilize the knowledge that your architect is providing. Your architect will be able to work with you on creative solutions that address such topics as style, proportion, light, balance and rhythm so that your new design is pleasing to the eye and unified with regard to the overall composition. If you are renovating an existing structure, there might be elements in place that will impact the design. And, if you are building new, you'll have the site to inform you of guiding principles for your design. One example of how the site is directly linked to the design is taking advantage of the view, whether it be to the water, a beautiful landscape or towards a significant landmark. Your architect has the knowledge to synthesize the functional needs of your project into the overall design in a pleasing style and efficient arrangement. Your architect will have the technical knowledge required to document and submit your building design to the building department in order to obtain your building permit. Your architect will have access to consultants such as geotechnical engineers, structural engineers, and interior designers who will provide specific services that may be needed on your particular project. During construction, your architect will be able to visit the site and observe if the building is progressing according to the design on your behalf and provide any answers to the General Contractor as the structure is being built. Read your construction estimate carefully. Before your start building your home renovation, addition or new building, make sure you read and reread your construction budget on your own and with your architect to see if the overall project is documented to reflect all the work show in the drawings and specifications. Avoid making changes during construction. Once the general contractor begins building, resist the impulse to make changes to your project or be prepared for the implications. A simple request to move a wall one foot further might require revised structural engineering, new unforeseen consequences to other spaces, permit revisions, additional construction time and more fees to your architect and general contractor. Be involved in your project. By staying on track with decisions and participating in the site meetings, you will make meetings more efficient and productive. When outstanding decisions are on the table, someone on the team is not moving and that could result in unanticipated delays to another player on the team. Managing unforeseen costs. When new costs are added to a project, make sure your general contractor has a system in place for quantifying these added costs and obtaining your approval prior to implementation so that you will not be faced with cost overruns at the end of the job. 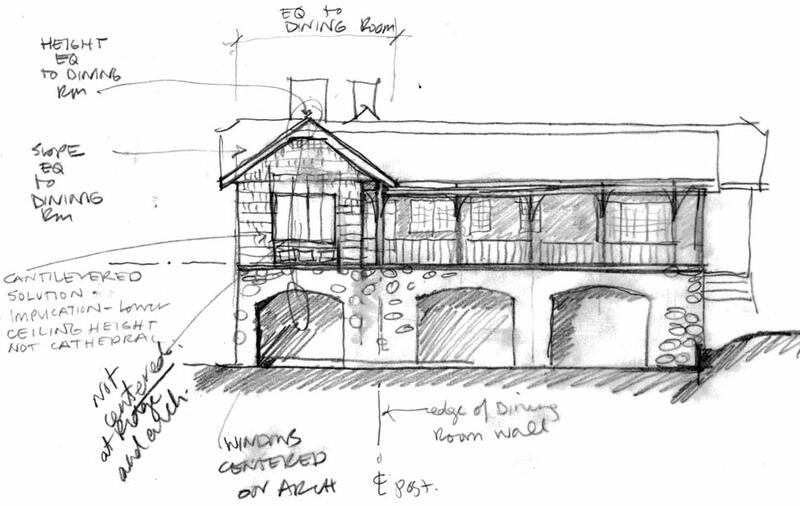 Your architect will work with you to define your design problem and document the solution in the form of architectural design drawings and specifications. Your architect will coordinate the work of the structural engineer, lighting design and interior designer. On the other hand, your general contractor will work with subcontractors and building inspectors to build the project. We can work with you to explore energy efficient building envelopes, mechanical systems and other efficient energy strategies to reduce your home's environmental impact and operating needs. If your goal is to create a design that is beautiful, healthy and respectful of the environment, our team has the knowledge to help you meet your goal. Feel free to e-mail us your question on our Contact page.